Tomorrow, God willing, we will hear at the Divine Liturgy the account of the holy Evangelist John. The account concerns how our Lord Jesus Jesus Christ gave to a man born blind a dual recovery of sight: both physical, from physical blindness, and spiritual, from spiritual blindness and ignorance. The Gospel says that the Lord, passing by, noticed the man born blind. Where had He come from? From the Temple. There, in the Temple, His spiteful enemies had wanted to stone Him. From the Gospels of Matthew, Mark, and Luke it is not entirely clear from where this terrible spite had come. It was a satanic hatred conceived by His enemies: the scribes, Pharisees, and Sadducees. From the Gospel according to John it becomes easy to understand, because just before this account of the healing of the man born blind, it is said that the Lord had been talking to them and they finally told Him: “Say we not well that thou art a Samaritan, and hast a devil” (Jn 8:48). But the Lord, in His discourse, mercilessly exposed them in them feeling that possessed them and, from His side, when they said boastfully and arrogantly that God was their father, said, “If ye were Abraham's children, ye would do the works of Abraham. If God were your Father, ye would love me. Ye are of your father the devil” (8:39). The Lord spoke that directly to them. In Slavonic: “Ye are of your father the devil, and the lusts of your father ye will do” (Jn 8:44), that is, you will behave the way he behaves. After this discourse, at the end of which He told them exactly Who He is, actually, in essence, they wanted to stone Him. He said the following words to them: “Your father Abraham rejoiced to see My day: and he saw it, and was glad” (Jn 8:56). His puzzled enemies asked Him: “Thou art not yet fifty years old, and hast Thou seen Abraham?” (Jn 8:57). The answer of Our Savior that followed was full of divine majesty: “Verily, verily, I say unto you, Before Abraham was, I am” (9:58), that is, before (past tense) Abraham, I am. The Lord, in His Divine Nature, is in the past and in the future as He is in the present. 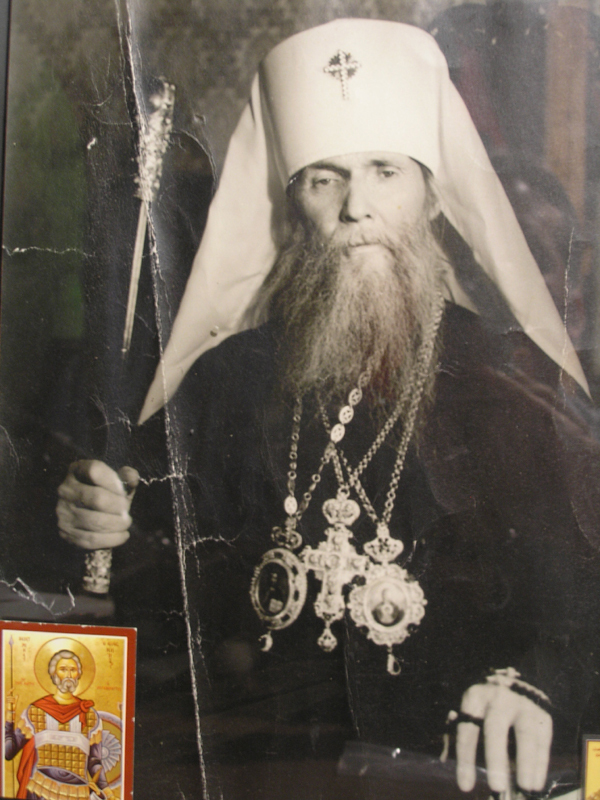 As St. John of Kronstadt put it: “The Lord, in one act of Divine contemplation, contemplates all of life, all centuries and all people.” When they understood what He was saying about Himself, took they up stones to cast at Him, but He passed by them. When he was leaving, passing by, He saw this blind man. When you read this account attentively, you will see right away how the blind man gradually recovered his sight. The Savior’s enemies were becoming more and more blind out of spite, while the formerly blind man recovered his sight. When he was asked for the first time how he was healed, he said only: “A man that is called Jesus made clay, and anointed mine eyes, and said unto me, Go to the pool of Siloam, and wash: and I went and washed, and I received sight” (Jn 9:11). When they asked him who He was and where He was, the former blind man said, “I know not” (Jn 9:12). But later, when the enemies were trying to make him oppose the Healer, they obtained the opposite result: the more they tried to assure him that he had been healed by a sinful man, the clearer he saw the light of the truth. After he simply names His Name he says: “He is a prophet” (Jn 10:17). But as they were getting at him with their cross-examination, he gave them a moral blow without even knowing it – an insult from their perspective! They were asking him again, and he said: “I have told you already, and ye did not hear: wherefore would ye hear it again? will ye also be His disciples?” (Jn 9:27). They said in anger: “Thou art His disciple; but we are Moses' disciples. We know that God spake unto Moses: as for this fellow, we know not from whence He is” (Jn 9:28-29) And now the former blind man condemned them, saying: “Why herein is a marvelous thing, that ye know not from whence he is, and yet he hath opened mine eyes” (9:30), that is, it is a surprising thing that He opened my eyes, and you do not even know where He is from! You are (it is implied) the spiritual rulers of the people, so who would know if not you? If you do not know whence comes this Man Who can make such astounding wonders, what good are you as the spiritual rulers of the people? And then he gives them a lecture: “Now we know that God heareth not sinners: but if any man be a worshipper of God, and doeth his will, him he heareth. Since the world began was it not heard that any man opened the eyes of one that was born blind. If this man were not of God, he could do nothing” (Jn 9:31-32). Nothing could be said against that, and so they resorted to abuse, because it was all they could do. They said: “Thou wast altogether born in sins, and dost thou teach us?” (10:34). And they cast him out. After this, when the Lord met him, He wanted to encourage the man. Strong-spirited as the former blind man was, he was desolate, of course, because banishment from the synagogue was a severe punishment for Jews. To encourage him, the Lord tells him, “Dost thou believe on the Son of God?” (Jn 9:35). The man’s answer shows clearly that he was ready to believe but did not yet know the object of his faith. He says: “Who is He, Lord, that I might believe on Him?”(Jn 9:36). The Lord, who had told a simple-hearted Samaritan woman that He was the Messiah, gives this man the same direct answer. The man asked him, “Who is He, Lord, this Son of God?” And our Savior said: “Thou hast both seen Him, and it is He that talketh with thee” (Jn 9:37) – He is! And the answer came rapturously out of the depth of the former blind man’s heart, “Lord, I believe” (Jn 9:38). And he worshipped Him. So this is the way, I repeat, that our Lord Jesus Christ granted the blind man dual recovery: physical and spiritual. But Christ’s spiteful enemies would not remain quiet and they asked him: “Are we blind also?” (Jn 9:40). They received another good lesson. The Lord answered them: “If ye were blind, ye should have no sin” (Jn 9:41). The one who does not see is not to blame; ignorance is no sin. We know that the Church in its penitential prayers marks a firm distinction between conscious, intentional sins and unconscious, involuntary sins. “If ye were blind, ye should have no sin,” the Lord says, “but now ye say, We see; therefore your sin remaineth” (Jn 9:41). Brothers, these are frightful words, frightful because the One Who said them is great beyond all measure! Because our Lord Jesus Christ is the only One Who can grant or not grant forgiveness, have mercy or condemn. And He says directly that their sin will remain. This Gospel, of course, is a lesson for all of us because not long ago, during Great Lent, we were praying: “Lord, grant me to see my sins.” It means we do not see them as we should, and therefore ask to see them better. That means we also lack spiritual sight. This is why we need always, and especially on this day, when we recall how God healed a man and opened his spiritual eyes, to pray to Him to open our blinded eyes and to give them the light of knowing Him. Amen. II: " For Judgment I am Come into this World..."
When the Lord healed the blind man, he was asked how it had happened. He said that he could not answer this question: he had been blind when the Lord approached Him. Probably he had heard what the Savior’s name was, which is why he answered: “A man that is called Jesus made clay, and anointed my eyes, and said unto me, Go to the pool of Siloam, and wash: and I went and washed, and I received sight” (Jn 9:11). They asked him who Jesus was, and he said “I know not” (Jn 9:12). He was led to the Pharisees, and they examined him. He said shortly: “He put clay upon mine eyes, and I washed, and do see” (Jn 9:15). Now there was a dispute between the Pharisees and Christ’s enemies, “a division among them,” as is said in the Gospel (Jn 9:16). Some of the Pharisees said, “This man is not of God, because he keepeth not the sabbath day” (Jn 9:16), which means he did not obey the law. Others argued saying, “How can a man that is a sinner do such miracles?” (Jn 9:16). The former blind man hears this dispute and the truth becomes clearer and clearer to him. So the words of one of the group of Pharisees (how can a man that is a sinner do such miracles) becomes the guiding line for his further actions. He was asked again and again, and cross-examined, and as they kept asking the same questions, he finally told them: “I have told you already, and ye did not hear: wherefore would ye hear it again? will ye also be His disciples?” (Jn 9: 27). For them, rabid enemies of Christ, to be His disciples?! The man had no idea, of course, what a blow his words were to them. So they told him with spite and anger: “Thou art his disciple; but we are Moses' disciples. We know that God spake unto Moses: as for this fellow, we know not from whence He is” (Jn 9:28-29).